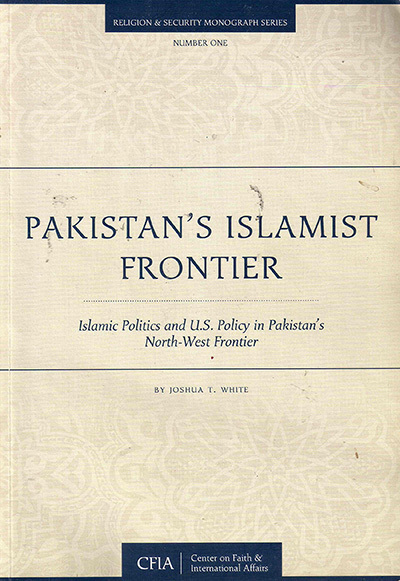 The Center on Faith and International Affairs announces the release of Pakistan's Islamist Frontier: Islamic Politics and U.S. Policy in Pakistan's North-West Frontier, first in CFIA's new Religion & Security Monograph Series. Printed copies of the monograph are available for $10. To order please contact the Institute for Global Engagement. "Joshua White has done an extraordinary task in revisiting commonly held assumptions about one of the most complex areas of Pakistan. This is the first contemporary work on the Frontier that collects and mobilizes new data. Through detailed fieldwork and analysis, Joshua demystifies in some measure the nexus of religion, politics and militancy...."
"Joshua has intimate, detailed knowledge of Islamic politics, Pashtun nationalism, and the roots of radicalism in Pakistan's Frontier regions. This lucidly written monograph offers an invaluable guide to strategies for improving local governance and countering insurgency. His suggested policy initiatives should greatly interest a new American administration and Congress." This study is an exceptional resource, and easily the single most in-depth and rigorous treatment of Islamic politics in Pakistan’s tribal Frontier today. We can only hope that U.S. and Pakistani policymakers will learn from Joshua’s research and experience in the region.